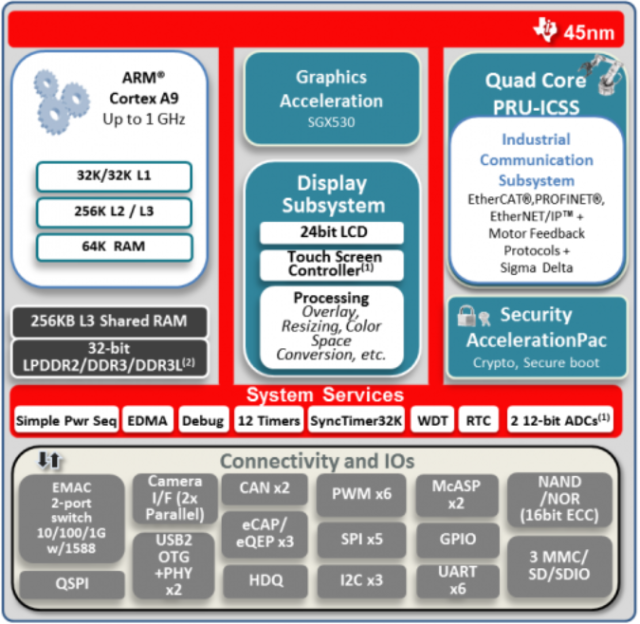 The first time I heard about Texas Instruments Sitara AM437x was via a TechNexion EDM-CT-AM437x system-on-module back in 2012, but Texas Instruments Sitara Cortex A9 processors development seems to have dragged a little longer than expected. Nevertheless, the company has now formally announced their Sitara AM437x ARM Cortex A9 SoC targeting automation, IoT gateways, and other industrial applications, and featuring four PRUs (Programmable Real-time Units), and support for dual camera for terminals with bar code scanning. Some interfaces (HDQ, McASP, eQEP..) seem specific to Texas Instruments, and if you’d like to get a short explanation of these, I’ve updated my technical glossary. The main differences between the four SoCs are related to the presence of a PowerVR GPU and EtherCat support as shown in the table below. Total power consumption will be less than one watt in active mode, about 5mW in deep sleep, and less than 0.03mW in RTC-only mode. AM437x processors are available in 17x17mm, 0.65mm VCA packages. Texas Instruments already have a software development kit based on Linux 3.x mainline and with a GUI launcher, as well as graphics and other demos. 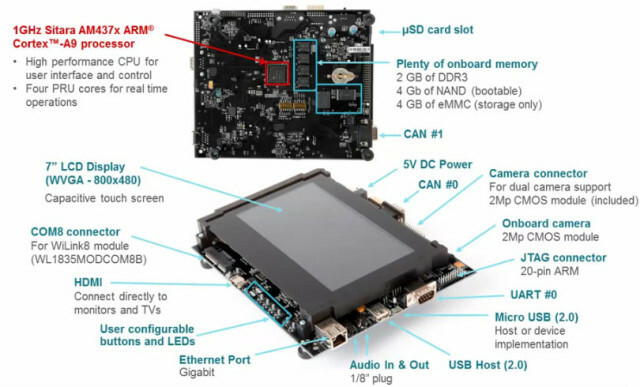 Adeneo Embedded also announced a Windows Embedded Compact 7 (WEC7) BSP for AM437x processors, SYS/BIOS RTOS with support for real-time industrial protocols will be available in Q3 2014, Android 4.3 or greater support will be released by a third-party in the fall of 2014. Other various RTOS solutions by Mentor Graphicsm, QNX, Wind River, Green Hills Software and Ittiam are also planned, but no timeline has been provided. The company has already readied an evaluation module based on AM4378 with a 7″ touch screen. The development kit currently supports the Linux SDK, and sells for $599. You can find more information on AM437x evaluation modules page. Two other evaluation modules are schedule for later this year: TMDXIDK437X Industrial Development Kit based on AM4379 with 1 GB RAM, and no display but with industrial protocols support thanks to SYS/BIOS RTOS (Q3 2014 – $329), and TMDXSK437X based on AM4378 with 1GB RAM, a 4.3″ capacitive touchscreen (Q4 2014 for less than $300). Eventually, I suspect there may also be a low cost platform for hobbyists… Beaglebone Green anyone? You can watch the introduction video below for an overview about TI Sitara AM437x SoCs, evaluation modules, and software solutions. LinuxGizmos reports Sitara AM437x processors will start sampling later this month, mass production is expected to begin Q4 2014, and pricing will be around $15 per unit for 1k orders. 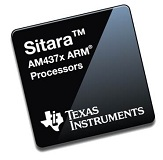 You can find more information on Texas Instruments’ Sitara AM437x page, as well as TI Wiki. According to the datasheets only 2 PRU is present in each device. So one of the document must be incorrect. AM4377 or AM4379 should match your requirements, no? But the development platform will only be available at bit later this quarter, and MP at the end of the year. Or do you need more than 2 PRU? I need 2 PRUs for EtherCAT and a generic LCD display interface. Unfortunatelly the AM335x’s series PRU1 share the pins with the LCD controller. Unfortunatelly Texas used the similar approach with the AM437x series as well. As a workaround I will possibly create a CPLD based glue circuit hooked to the GPMC to create a memory mapped LCD controller.